Jerry A. Coyne is Professor Emeritus in the Department of Ecology and Evolution at the University of Chicago, where he specialized in evolutionary genetics. He is also the author of Faith Versus Fact: Why Science and Religion are Incompatible. "Coyne's book is the best general explication of evolution that I know of and deserves its success as a best seller." "[Coyne] makes an unassailable case." "In nine crisp chapters...the respected evolutionary biologist lays out an airtight case that Earth is unspeakably old and that new species evolve from previous ones." "I recommend that Mr. Coyne's insightful and withering assessment of evolutionary studies of human psychology and behavior be taped to the bathroom mirrors of all those (perhaps especially journalists) inclined to be swept into excited announcements of What Evolution Shows About Us." "With logic and clarity, Coyne presents the vast trove of scientific evidence that supports Darwin's theory." "It's always a pleasure to tell people about a wonderful book, especially when the subject of the book is of universal and critical importance. Evolutionary geneticist Jerry A. Coyne has given us such a book...A book that may change the way you look at things-if you dare." 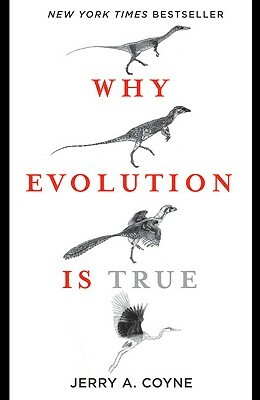 "In this 200th anniversary year of Darwin's birth, Why Evolution is True ranks among the best new titles flooding bookstores."